I would love to proclaim The Hollow Earth by Raymond Bernard as a fascinating read. Honestly, I would. Whether the reader buys into the premise or casually dismisses it as fanciful, the topic is one that should make for interesting reading. At least, that was the initial thought that drew me to searching out a copy of the 1979 publication. Starting with bold red letters on the book’s front cover, the text draws its momentum from a series of questions that never quite get answered. The book jacket asks, “Is this the greatest discovering in history?” but the 250 pages that follow never present any evidence of a discovery. Remaining questions are not only sequestered on the backside of the book jacket, but also asked time after time throughout the book (as if repetitious asking lends credence to the question itself and the supposition that is grafted to it as a response). Questions include: why one finds tropical seeds, plants, and trees embedded in icebergs; why millions of tropical birds and animals go farther north in winter; why it’s warmer at the poles than 600 to 1000 miles away from them; and why the winds blowing out of the Arctic get warmer as explorers approach the pole. These are all fun questions to ask, but there’s not a shred of documented evidence given to verify that any of the questions are indeed valid. Another discouraging factor for the reader is Bernard’s tendency to repeat large portions of text almost word for word. One example of this can be found on page 81, where Bernard states, “Polar explorers not only mention fauna (animals) but flora (vegetation) in the extreme north. Also many animals, like the musk-ox, strangely migrate northward in winter….” This continues for two full paragraphs. Then, on page 84, the entire text is repeated almost word for word and, at that point, attributed as a quote from a March 1962 article, written and published by Ray Palmer, the editor of Flying Saucers Magazine. In the article, “The North Pole – Russian Style,” Palmer is relaying information from Russian explorers who are, as far as I can tell via Bernard’s excerpts, unnamed and unverified. The books includes excerpts from Admiral Byrd’s controversial diary account of his journey into a previously unknown realm. 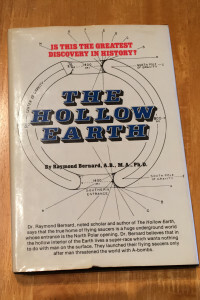 It also sites information from authors William Reed, “Phantom of the Poles,” Marshall B. Gardner, “A Journey to the Earth’s Interior or Have the Poles Really Been Discovered?” the aforementioned writer and editor of Flying Saucers Magazine, and others. All in all, the book is a reproduction of a number of different works. It includes a series of questions raised by Bernard, which he seems to borrow from others, and Bernard’s proposed “only logical response” to such questions (which he also seems to borrow liberally from others). The Hollow Earth tackles an intriguing topic and could be a riveting page turner, if only it were better composed. It’s on my bookshelf as a conversation piece, but it offers little real value as a resource of validated information.